Do you remember the Black Swans and the beautiful 4 cygnets? Today, like I do once a week, I went to "my lake" to see if Melbourne Water has done the monthly cleaning. I found a crew weeding by hand (no chemicals), isn't that geat? I told them that i think they are doing a great job. Then we started talking. 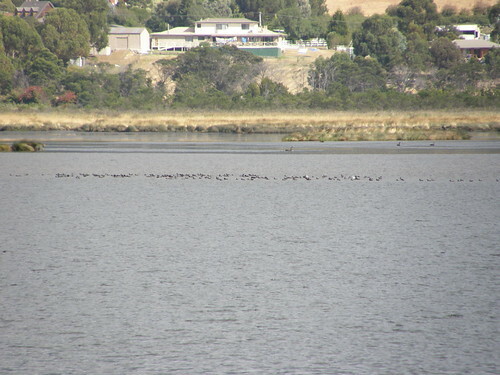 The same crew cleans other Wetlands, like Seaford etc. when I told them how sad it was for the little cygnets to vanish, (most likely attacked by dogs, cats or people trowing stones at them, as I have seen myself), they told me these 4 little swans, and the 2 others before them, were the only ones they saw this summer. None of the many Swans at the other Wetlands they look after had any young because of the drought. Now, I'm very intersted in hearing about your observations, where you live, did you see any Swana and "cygnets"?? The photo was taken the first day the Cygnets appeared, only one week later "none" was left. When we went to the wetlands near your house, we saw at least 30 (or more?) 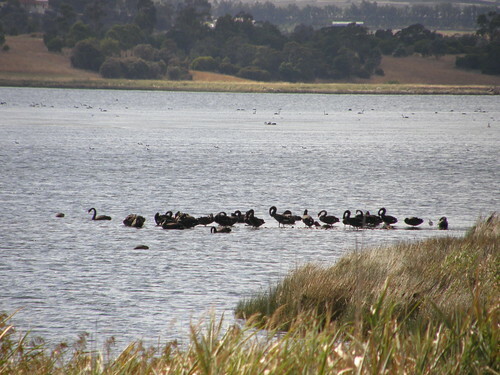 Black Swans,have you seen ANY CYGNETS? The guys from Melbourne Water, that looks after those wetlands , said they haven't been any this summer. Beautiful photo, awful to wonder what happened to them. 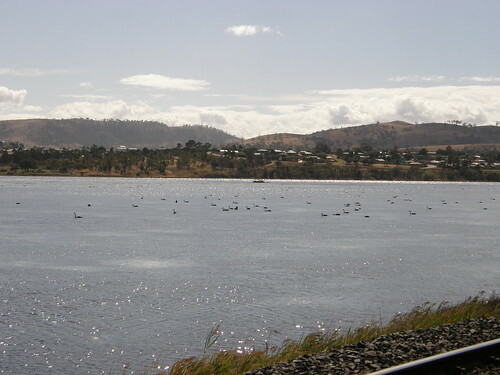 The swans are plentiful in Hobart this year, I wonder if some from up there have traveled abroad? Along the Derwent, within the space of maybe 5km, I would guess there's about 1000 adults at the moment. I've seen cygnets of all ages, most of which are now adults or near adults. Hope that helps to cheer you up. If the weather isn't too bad tomorrow, I might try to get some photos. Thanks so much Scott, at least there some cygnets somewhere. That makes me a "little" happy. I hope after all that rain, the Swans will have a better breeding season next year. I ould love to see some photos. To ease your mind a little further, Araminta, an ecological guru on ABC radio in Adelaide this morning commented that birds such as black swans & pelicans disburse when the interior has big rain. 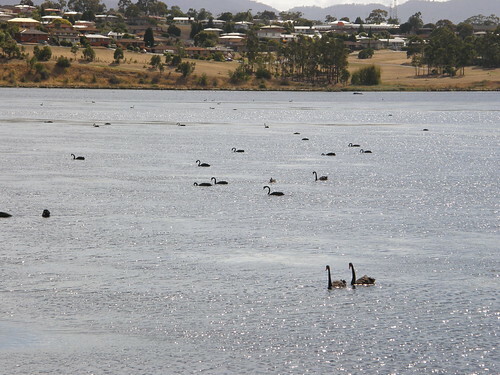 A caller from Terowie, a semi desert area, said that a lake near Terowie has had water in it for a couple of years because of the rains & it currently has a large population of black swans. So at least he species is thriving in parts although the fate of your swans & their youngsters will probably remain unknown. And I like the way you engage the Melbourne Water staff in discussion & praise their efforts. These sorts of people get their fair share of criticism so if we can praise them when they're doing helpful things in the environment it helps to create a caring ecological culture. Thanks again Scott for that information. 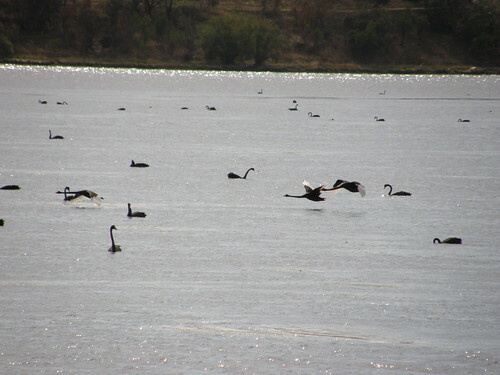 Here is a photo of Pelicans on , what is called "Swan Lake" but hardly any Swans on it. But I could not get them in one photo, there were hundreds of Pelicans in the distance, very far distance. If you extend the picture to the left and right, there were more than three times the amount of birds. Hardly any Pelicans on it yet either, it takes a long time for the photo to come up? Not awe-inspiring photos, but I hope you get the gist... And also that it gives you some sense of optimism M-L. Thanks so much Scott, for showing me those photos, it did make me feel good. Where in the world would you see something like that? When I was a little girl , I used to admire hundreds of Pink Flamingos fly over every evening ,to roost in the Camargue (in the South of France), an image I will never forget. When those Pelicans took off , it touched my heart, watching them circle and fly off was an awsome experience. Just beautiful. That's interesting M-L. I thought they were only in Africa or something like that where the algae in the water turns their feathers pink. I suppose it's not relly very far from Africa, perhaps they migrate there? You are right there Roger, they used to migrate to Africa. 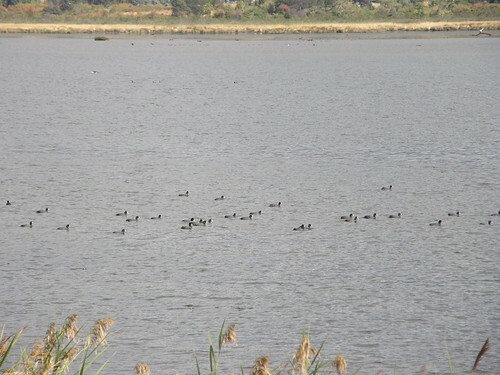 But in the South of France and in the Camargue you find huge flooded areas,saltwater wetlands, and freshwater. No shortage of food for Flamingos. These days the majority of them stay over winter, but some still go to Africa during the winter months. I believe there are also a lot of flamingos found in South America, in southern Venezuela/northern Brazil in an area known as the Pantanal. There is a fair bit of tourism out there to see flamingos, anacondas, jaguar if you are lucky.